A demolition project completed by R. Baker & Son All Industrial Services was recently featured in the magazine Equipment Today. Equipment Today provides the commercial construction industry with information for equipment selection, application, maintenance, and asset management, as well as safety and regulation. It serves contractors in highway and heavy general building demolition, utility, and other construction segments. 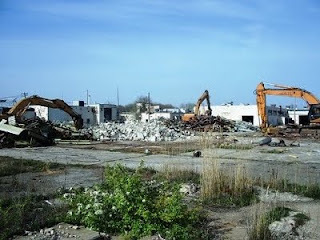 The article in the magazine described how R. Baker & Son completed the demolition of a large chemical manufacturing facility in New Jersey (NJ). The facility, which formerly manufactured a variety of chemicals, consisted of over sixteen (16) multi-story buildings and was situated near a major waterway. The buildings were well over 50 years in age and were predominantly block wall and steel truss roof or wood beam construction. The project was completed safely and on schedule and budget.